There are some outstanding examples of this overdate, and demand drives the prices up by leaps and bounds. An MS66 tops the census and there are several high grade survivors at the top of the census. 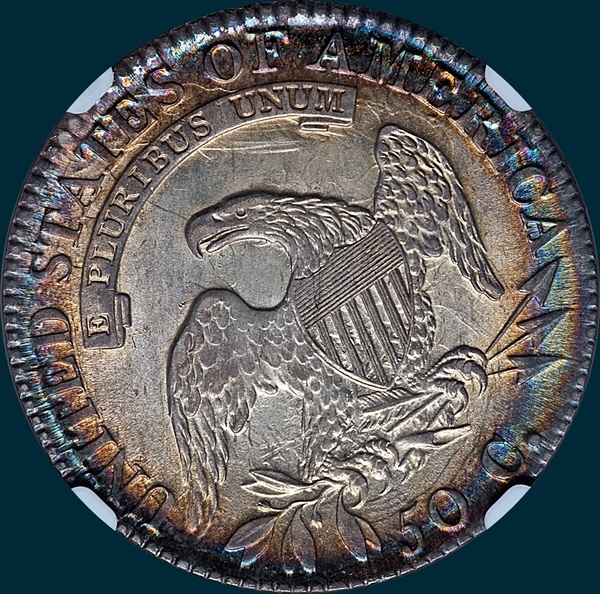 There are only 7-8 specimens known to have no die cracks on the obverse. 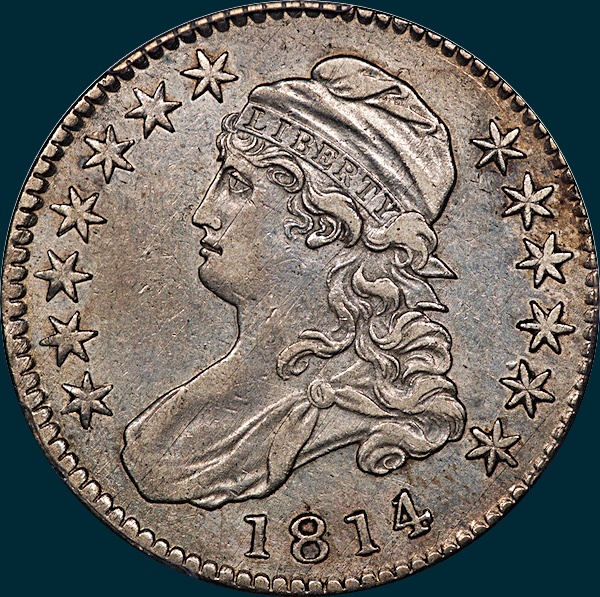 Variety Attribution: Obverse- 1814 over 13. Date is 9 mm., top crossbar and lower curve of 3 shows under 4. O-101a: Die crack at edge opposite end of bust joins stars 1 through 6, then curves across cap to join all stars on right. Additional sharp die crack at bottom of date. Reverse- 50 C. is 2 mm. and low. Arrow to A is 1/2 mm. Two oversized segments are above second T in STATES, the one on left is attached to top of the T with a defect. Some early die states show a vertical die line extending 2 mm. below eagle's beak and other extending upward from left wing. Specimens observed show clash marks both obverse and reverse. O-101a: Die crack from edge near left wing tip, that joins UNITED ST near the base then to top of A1. 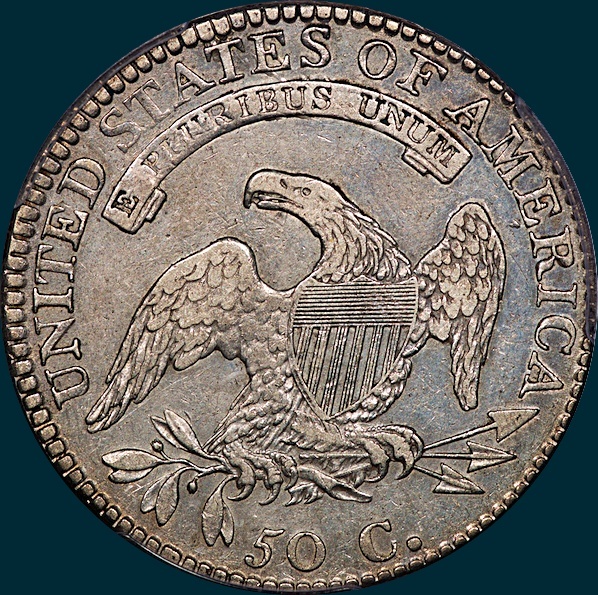 According to Edgar Souders, he estimates that the projected mintage for this overdate is approximately 115,452. Get his book Bust Half Fever and read all about overdates and how he came up with the number! 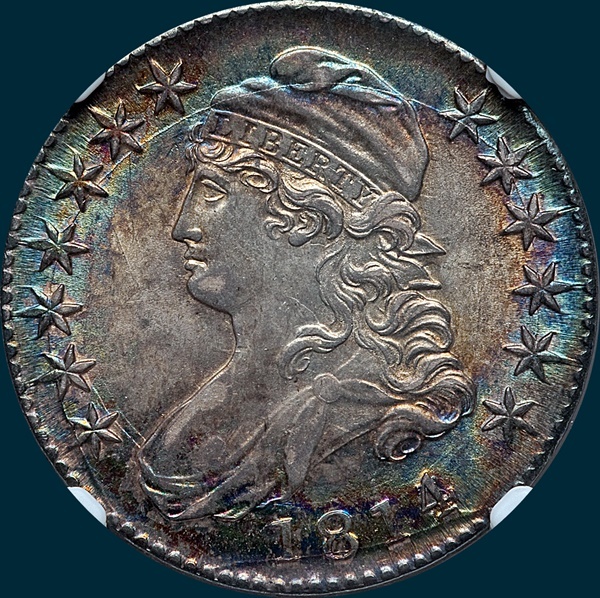 The edge on some of these 1814/3 overdates was done in 1813, before the star was added between DOLLAR and FIFTY, while other 1814/3 overdates do have the star between DOLLAR and FIFTY.